The Tones will teach you how to swing with the tempo ratio exhibited by the Tour Pros. We measured the time of their backswings and downswings by counting how many frames of video each part took. The magic ratio on full swings turned out to be three parts backswing to one part downswing. Tones are provided for each of the following frame ratios of Tour Tempo – 18/6, 21/7, 24/8, and 27/9. The Tour Tempo Tones have a clear purpose. They establish the intrinsic tempo of the golf swing in your subconscious mind. Once this is accomplished, you will not have to think about tempo while playing. This is what the Tour Pros have already done. You are about to acquire that same ability. 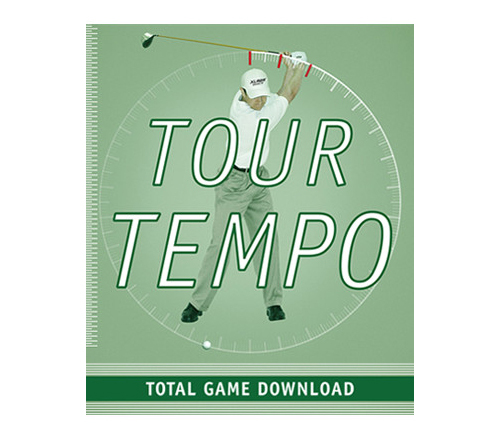 The Total Game also contains the new Tour Tempo Short Game Tones of 14/7, 16/8, 18/9, and 20/10. After the publication of Tour Tempo, John Novosel studied the Short Game swings of the top touring pros, and discovered that virtually all of them employ a 2 to 1 swing ratio on or around the greens – a different Tempo than the 3 to 1 ratio of the Long Game. This is another reason why the game of Golf is so hard to master. The videos give a complete explanation of the Tones and how to use them to immediately and dramatically improve your Total Game. ***Bonus*** – One Tempo Track and one Focus Track from the Tour Tempo Tracks MP3 Volume II Edition are provided for each of the three principle frame ratios of Tour Tempo – 21/7, 24/8, and 27/9. The Tour Tempo Tracks are an easy way to integrate Tour Tempo into your daily routine. One of the best ways to use the Tracks is to listen to them while driving to the course before a round of golf. The more you listen to them, the more the Tour Tempo rhythm will be ingrained into your Golf Swing. The Total Game is your first step towards a more powerful, consistent golf game, and that is why we are giving you a discount at the Tour Tempo Shop. When you buy now, inside your zip file in the Read Me First document, you will find a one-time discount code good for $10 off your next order at our online shop. Save the downloaded TOTALGAME.zip file to the hard drive. Right click on the file and select Extract all. This will open the extraction wizard. Click Next and then select the location to extract the files to. Click Next again and the extraction process will begin. Make sure that the Show Extracted Files option is checked. If on Mac: Double-click the downloaded zip file to unzip.